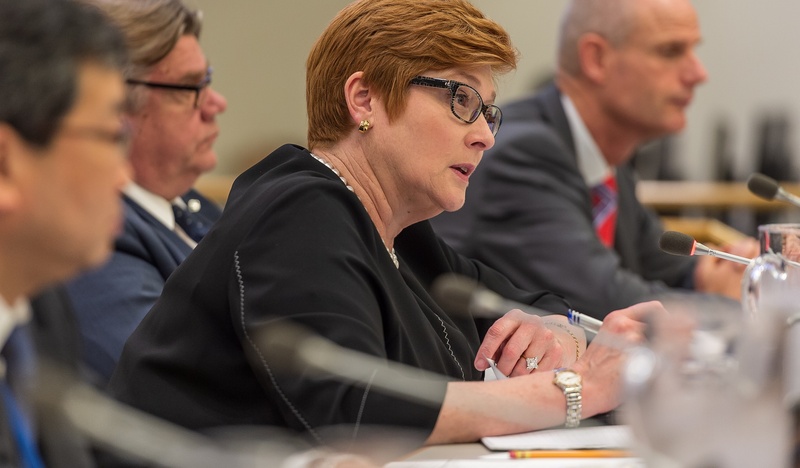 It says something about how the international relations agenda has changed that Foreign Minister Marise Payne was 90% of the way through her 4000-word Lowy Institute speech last week before she even announced the only news: the government’s rebadged “economic and commercial diplomacy” policy. In 2014 Julie Bishop and Andrew Robb were each papering the town with speeches that long about their shiny new economic diplomacy strategy alone. Bishop had a memorable regular line: “If the goal of traditional diplomacy is peace, then the goal of economic diplomacy is prosperity. Economic diplomacy is today at the heart of the Government's foreign policy.” Payne has hardly improved on that with: “Using our full suite of diplomatic resources, we will continue to advocate for an open global economy, to support Australian businesses seeking commercial opportunities in major emerging markets, and to strengthen our international competitiveness.” See Alex Oliver’s take here. But the times have changed since the high falutin rhetoric of 2014 about solving world prosperity and scooping up trade deals in North Asia. Business is demanding more nitty gritty commercial diplomacy assistance and DFAT is paying more attention to its reputation at home. The old economic diplomacy was a bit like the old banking system, with four simple pillars: trade, growth, investment, and business. But under the new economic and commercial diplomacy now we have five carefully sculpted pillars: promoting investment; addressing non-tariff barriers; supporting and facilitating business; advocating for the global rules-based trade system; and increasing science, technology and innovation links. Peter Varghese’s India Economic Strategy has contributed to this redefinition exercise by essentially proselytising a resource-intensive, non-traditional "Australia Inc" approach to what will be the world’s second-largest economy. And while we haven’t actually seen the real source of the cash, the Morrison government has promised more money (in the Pacific infrastructure facility and the new Export Finance Insurance Corporation funding) for the new pillars than the old pillars ever got. Here’s a fascinating bit of opinion polling that might help place the Chinese Big Red Infrastructure (otherwise known as the Belt and Road Initiative or BRI) challenge in a different light. HSBC’s annual Global Navigator survey of 8600 businesses in 34 countries suggests they regard the BRI as having about the same amount of positive, negative or neutral impact as Southeast Asia’s 2025 economic integration program (known as the ASEAN Economic Community or AEC). The survey suggests, not surprisingly, that better free trade agreements and industry standards are the most useful policy initiatives for globally oriented businesses while rising tariffs, the US political situation and the US-China row are the most negative. But perhaps the most striking finding from an economic diplomacy perspective is how many companies seem to be turning to intra-regional trade rather inter-regional (or global) opportunities in a changing global environment. The proportion of European and North American companies citing Asia as their top growth market has fallen respectively from 26% to 13% and 33% to 15% this year. Meanwhile Asian companies seeing North America as the top growth market fell from 29 to 21%, while the proportion favouring China rose from 12% to 16%. There are potentially many factors at work here but while the surveyed businesses are generally quite positive about the overall outlook, geo-political uncertainties may be driving a more regionalised global economy. Given Prime Minister Mahathir Mohamad’s new Malaysia has become the widely celebrated poster nation of the Asian democratic backlash against the BRI (by postponing major Chinese-funded projects), it is interesting to see more nuanced messages emerging closer to home. The BRI is important for ASEAN especially given the significant infrastructure needs in the region...(It) can leverage the existing close China-ASEAN economic relationship as a foundation for greater future collaboration in that China has been ASEAN’s largest trading partner for close to 10 years. However, there is a greater need for both China and ASEAN to address governance issues to ensure BRI is not just a win for one country but a success for all. And while bluntly rejecting Chinese economic neo-colonialism, Mahathir makes a remarkable comparison in a very reflective return-to-power interview in the latest Mekong Review (pay-walled). He suggests China has so far been historically less threatening to Malaysia than the Portuguese in the 1500s. He goes on to say the main issue in the South China Sea is not competing claims but whether ships can freely navigate. Asia’s most interesting old/new leader is not going to be easily pigeon-holed into retirement.